Fig. 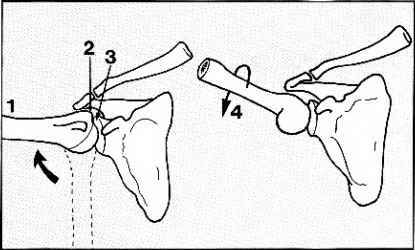 4.A: The shoulder is complex, and it is important to note that it has two main components, namely the glenohumeral joint (between the head of the humerus and the glenoid) and the scapulothoracic joint (between the scapula and the chest wall). The latter is a physiological rather than an anatomical joint, as it has no synovial cavity. The glenohumeral joint accounts for about half of shoulder abduction (1). and this comes to an end when the greater tuberosity (2) impinges on the glenoid rim (3); the range of glenohumeral movement (about 90°) can be increased if the arm is externally rotated (4), thereby delaying the impingement of the greater tuberosity. Note that shoulder rotation occurs mainly in the glenohumeral joint. Fig. 4.B: In the scapulothoracic joint the scapula (S). moves over the rib cage and serratus anterior. It is supported by the clavicle (C) (which articulates with the scapula at the acromioclavicular joint (AC), and with the sternum at the sternoclavicular joint (SC)), and by trapezius, rhomboids, levator scapulae and serratus anterior. 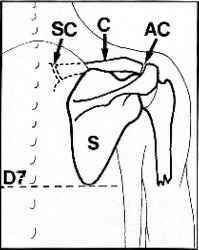 The inferior angle of the scapula normally lies at the level of D7. Fig. 4.C: The scapula, however, is normally a very mobile structure, varying in its position and permitting a wide range of scapulothoracic movements. 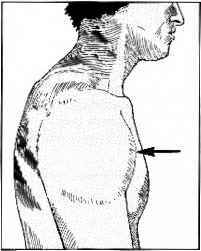 The scapula may be elevated (e) or depressed (d), with a maximal total excursion in the order of 12 cm. (Note that elevation of the shoulder is a pure scapulothoracic movement, and must be distinguished from elevation of the arm. The latter term enjoys some popularity as a replacement for abduction or flexion, but because it is somewhat confusing it is probably best avoided.) The scapula may be rotated medially, or laterally and forwards (m. I) round the chest wall. It may also be tilted upwards (u) or downwards, with the glenoid angling in a corresponding fashion. When the glenoid is directed upwards, the angle between the vertebral border of the scapula and the vertical may reach 60°. Scapular movement is only possible if there is freedom at the acromioclavicular and sternoclavicular joints, and between the scapula and the chest wall. Fig. 4.D: Abduction of the shoulder (1): During the first 90° of abduction the glenohumeral joint is involved more than the scapula (a), whereas beyond 90° abduction is continued mainly by scapular movement (b). During the last 30° of abduction, when the glenohumeral joint is locked and the scapular attachments are tightening, movements of the spine may make a contribution: e.g. abduction of the shoulder may lead to some lateral flexion of the thoracic spine (T). The cervical spine may also laterally flex to the other side, to preserve the posture of the head. When both arms are abducted, neither the thoracic nor the cervical spine laterally flexes, but there may be an increase in lumbar lordosis. Fig. 4.F: Abduction (3): In spite of the tendency for glenohumeral and scapular movements to dominate specific portions of the abduction arc, it should be noted that there is no abrupt transition from one to the other, and indeed all the shoulder girdle joints make a contribution to nearly every movement that takes place in this region. The exceptions are shrugging movements, which do not involve the glenohumeral joint, and external rotation, which does not involve scapular movement. The shoulder cuff: The glenoid (g) is widest inferiorly. Anteriorly lies the coracoid (co), and above is the supraglenoid tubercle (sg), from which the long head of biceps (b) arises. The fibrocartilaginous labrum (1) deepens the glenoid concavity and is attached to its peripheral margin, along with the joint capsule (c). The capsule is reinforced with the musculotendinous insertions of supraspinatus (s), subscapularis (sc), infraspinatus (i) and teres minor (t). which fuse with the capsule laterally, forming a complete tissue annulus (the shoulder cuff). The supraspinatus is its most important part. This in effect runs through a tunnel formed by the spine of the scapula (ss). the acromion (a), and the coracoacromial ligament (ca). It is partly separated from the acromion by the subdeltoid bursa (b). The commonest cause of shoulder pain is cervical spondylosis. Pain from irritation of nerve roots in the neck is referred to the shoulder in the same way as pain originating in the lumbar spine may be referred to the hip. There may on occasion be simultaneous pathology in both shoulder and neck, but differentiation is usually straightforward; in particular, restriction of movements of the shoulder with pain at the extremes points to the shoulder as the site of the principal pathology. The rotator cuff (and the subdeltoid bursa) may be compressed during glenohumeral movement, giving rise to pain and disturbance of scapulothoracic rhythm. The commonest site is subacromial, causing a painful arc of movement between 70° and 120° abduction. Compression may also occur beneath the acromioclavicular joint itself, when there may be a painful arc of movement during the last 30° of abduction, or deep to the coracoacromial ligament. Symptoms may occur acutely (e.g. in young sportsmen, especially those engaging in activities involving throwing) or be chronic, particularly in the older patient. In this latter group there are usually degenerative changes in the acromioclavicular joint which lead to a reduction in size of the supraspinatus tunnel; this may cause attrition and rupture of the shoulder cuff. There is a small group of cases where there is no narrowing of the tunnel, but where there is often thickening of the subdeltoid bursa or of the rotator cuff tendons. Note also that severe shoulder pain may occur in patients being dialysed, and is often due to subacromial impingement on amyloid deposits. In the acute case, symptoms generally respond to rest or modification of activities. In the chronic case, physiotherapy, analgesics, and the targeted injection of local anaesthetic and steroids may be helpful. If symptoms become persistent and remain disabling, surgery may be required. The commonest procedure (by open surgery or by arthroscopy) is a decompression of the subacromial space; this may involve excision of osteophytes, an AC joint arthroplasty, and excision of the coracoacromial ligament. In the young athletic patient the shoulder cuff may be torn as the result of a violent traumatic incident. In the older patient tears may occur spontaneously (e.g. in a cuff weakened as a result of chronic impingement and attrition) or follow more minor trauma, such as sudden arm traction. It may occur in patients suffering from instability of the shoulder joint. Most commonly the supraspinatus region is involved, and the patient has difficulty in initiating abduction of the arm. In other cases the torn shoulder cuff impinges on the acromion during abduction, giving rise to a painful arc of movement. Although the range of passive movements is not initially disturbed, limitation of rotation may supervene, so that many of these cases, particularly in older patients, become ultimately indistinguishable from those suffering from so-called frozen shoulder. In the young patient, surgical repair of acute tears is generally advised. In the older patient the indications for surgery are less clear, but operative repair, often combined with a decompression procedure, is becoming increasingly recommended. Arthroscopic repair may be performed, although it is technically demanding. In every case, prolonged postoperative physiotherapy is usually required. If complete rotator cuff tears are neglected, the loss of soft tissue above the head of the humerus may lead to its proximal migration. Friction between the humeral head and the acromion may result in bony collapse and gross degenerative changes in the glenohumeral joint, which in severe cases may lead to joint replacement having to be considered. 'Frozen shoulder' is a clinical syndrome characterized by gross restriction of shoulder movements and which is associated with contraction and thickening of the joint capsule. It is a condition that affects the middle-aged, in whose shoulder cuffs degenerative changes are occurring. Restriction of movements is often severe, with virtually no glenohumeral movements possible, but in the milder cases rotation, especially internal rotation, is primarily affected. Pain is often severe and may disturb sleep. There is frequently (but not always) a history of a minor trauma, which is usually presumed to produce some tearing of the degenerating shoulder cuff, thereby initiating the low-grade prolonged inflammatory changes and contraction of the shoulder cuff responsible for the symptoms. In a number of cases there are fibrotic changes in the coracohumeral ligament which resemble those found in Dupuytren's disease. In some cases the condition is initiated by a period of immobilization of the arm, not uncommonly as the result of the inadvised prolonged use of a sling after a Colles' fracture. It is commoner on the left side, and in an appreciable number of cases there is a preceding episode of a silent or overt cardiac infarct. It is commoner in diabetics. Radiographs of the shoulder are almost always normal. If untreated, pain subsides after many months, but there may be permanent restriction of movements. Generally those with the most severe initial symptoms have the poorest outcome in terms of final mobility and overall function. The main aim of treatment is to improve the final range of movements in the shoulder, and graduated shoulder exercises are the mainstay of treatment. In some cases where pain is a particular problem, hydrocortisone injections into the shoulder cuff may be helpful. In a few cases, if there is no improvement with appropriate treatment for 4 months, manipulation of the shoulder under general anaesthesia or athroscopic capsular release may be helpful in restoring movements in a stiff joint. Degenerative changes in the shoulder cuff may be accompanied by the local deposition of calcium salts. This process may continue without symptoms, although radiographic changes are obvious. Sometimes, however, the calcified material may give rise to inflammatory changes in the subdeltoid bursa. Sudden, severe incapacitating pain results; the shoulder becomes acutely tender, and is often swollen and warm to the touch. It is important to differentiate the condition from an acute infection, or an acute attack of gout. Symptoms are relieved by the removal of the material by aspiration or curettage, but often local injections of hydrocortisone suffice. The joint is frequently so acutely tender that general anaesthesia is necessary for any attempted aspiration and injection of hydrocortisone. Good results have also been claimed following extracorporeal shock-wave therapy. Arthritic changes in the acromioclavicular joint may give rise to prolonged pain associated with shoulder movements (with or without shoulder cuff involvement and the production of an impingement syndrome). 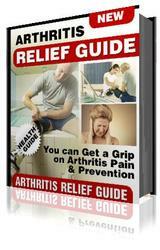 There is usually an obvious prominence of the joint from arthritic lipping, with well localized tenderness. Conservative treatment with local heat and exercises may be helpful, but occasionally, in severe persistent cases, acromionectomy may be considered. Osteoarthritis of the glenohumeral joint is rare, and when it occurs is most frequently secondary to avascular necrosis of die humeral head. This may be idiopathic in origin, or follow a fracture of the proximal humerus which interferes with the blood supply of its head. It may result from faulty decompression regimes in deep-sea divers, caisson workers and pilots, and it may follow radiotherapy (radionecrosis), particularly following treatment for carcinoma of the breast. If empirical treatment fails, joint replacement may have to be considered. Rheumatoid arthritis is more common than osteoarthritis in the shoulder, and the features are similar to those of the condition in other joints. It is necessary to localize the site of the main pathology so that treatment may be directed effectively, and diagnostic sequential injections (into the acromioclavicular joint, the shoulder cuff, and then the glenohumeral joint) may be helpful in this respect. Medical treatment and intra-articular injection therapy are tried first. In more advanced cases, where the symptoms are the result of impingement, decompression procedures may be highly effective. Where the glenohumeral joint is severely diseased, joint replacement will generally produce pain relief and improved function. The shoulder may be affected by anterior, posterior or inferior instability. When the shoulder is unstable in several planes, then multidirectional instability ('loose shoulder') is said to be present. Anterior instability is the commonest, and in many cases this follows a frank dislocation of the shoulder. It occurs most frequently in the 2CM-0-year age group. There may be a history of repeated dislocations in which the causal trauma has become progressively less severe (recurrent anterior dislocation of the shoulder). The shoulder is often symptom free between incidents, but there may be some pain and weakness. Surgical repair is generally advised if there have been four or more dislocations, but each case must be carefully assessed to exclude shoulder laxity in other planes: many case of failed reconstruction are due to an associated posterior instability. Trauma to the shoulder may also result in posterior dislocation, which can proceed to recurrent posterior dislocation. Posterior dislocation of the shoulder is much less common than anterior dislocation and the diagnosis is sometimes overlooked, especially when only one radiographic projection is taken. Surgical reconstruction is sometimes required, but this may fail if concurrent anterior instability is not taken into account. Anterior and multidirectional instabilities may occur without previous trauma, and never proceed to frank dislocations or obvious subluxations. The condition may be congenital in origin. The primary complaints are of pain and weakness in the shoulder, and the rapid onset of joint fatigue during activity. The arm may feel 'dead'. In the case of multidirectional instabilities muscle retraining is generally advocated, although surgical reconstruction is sometimes attempted. Recurrent dislocation of the shoulder should be differentiated from habitual dislocation. In the latter the patient is often psychotic or suffering from a joint laxity syndrome. The shoulder repeatedly dislocates without much in the way of pain; the patient is often able to dislocate and reduce the shoulder voluntarily and with ease; and the radiological changes that are found in recurrent dislocation are not present in habitual dislocation. When habitual dislocation is found in children the prognosis is good, and surgery is never indicated. In the adult, surgery is usually best avoided (as the results are often poor), but good results are being claimed for biofeedback reeducation of the shoulder muscles. Staphylococcal osteitis of the proximal humerus is the commonest infection occurring near the shoulder in this country at present; nevertheless, it is comparatively uncommon. Gonococcal arthritis of the shoulder is uncommon, but when it occurs there is moderate swelling of the joint and great pain, which often seems out of keeping with the physical signs. Acromioclavicular dislocation The acromioclavicular joint may be disturbed as a result of a fall on the outstretched hand or on the point of the shoulder. If care is taken during examination, a lesion of this joint will not be confused with one of the glenohumeral joint. In major injuries the conoid and trapezoid ligaments are torn and the clavicle is very unstable: surgical fixation of the clavicle to the coronoid (by a screw or a sling procedure) is sometimes advised. In less severe cases the acromioclavicular capsular ligaments only are torn. Although the outer end of the clavicle becomes prominent, it follows the movement of the acromion and conservative treatment with a sling for several weeks is all that is required. These injuries are frequently missed, as they often do not show in the routine recumbent radiographs of the shoulder. Clavicle Primary pathology in the clavicle is uncommon, but a cause of confusion is pathological fracture due to radionecrosis years after treatment for breast carcinoma. The fracture may be preceded by pain for many months, and be mistaken for metastatic spread. 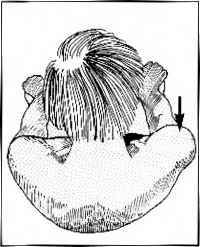 Snapping scapula A patient may complain of a grinding sensation arising from beneath the scapula. This is often due to a rib prominence, but in some cases it may be caused by an exostosis arising from the deep surface of the scapula itself. When symptoms are persistent, excision of such an exostosis may give relief. 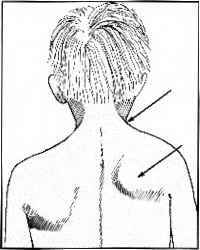 High scapula There are several related congenital malformations affecting the neck and shoulder girdle. In the most minor cases one scapula may be a little smaller than the other and be more highly placed; in more severe cases one or both shoulders are highly situated, the scapulae are small, and there may be webs of skin running from the shoulder to the neck (Sprengel shoulder). In the Klippel—Feil syndrome the neck is short and there are multiple anomalies of the cervical vertebrae, which may include vertebral body fusions and spina bifida. Apart from highly placed scapulae, other congenital lesions may be found in association with the Klippel—Feil syndrome; these include diastomatomyelia resulting in tethering of the spinal cord and neurological involvement; lumbosacral lipomata; and renal abnormalities. Winged scapula The patient complains of prominence of the scapula, its vertebral border being raised from normal contact with the chest wall. This is due to weakness of the serratus anterior. The cause may be primarily muscular (as in progressive muscular dystrophy) or follow traumatic paralysis of the long thoracic nerve. Active treatment is seldom necessary. 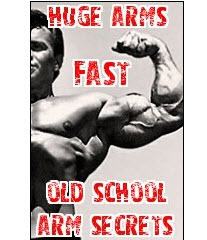 Ruptured biceps tendon Rupture of the long head of biceps may occur spontaneously or as a result of a sudden muscular effort, usually in an elderly or middle-aged person in whom degenerative tendon changes are present. No treatment is usually required. In some cases the tendon may cause a detachment of its insertion into the superior part of the glenoid (SLAP lesion); in the young athletic patient surgical reattachment may be advocated. Biceps tendon instability and tendininitis Anchorage of the biceps tendon in its groove may become faulty, so that certain movements of the shoulder may cause it to snap in and out of its normal location. This often occurs in association with a shoulder cuff tear, and isolated tendon lesions may be difficult to differentiate from pure cuff tears. The tendon may become inflamed (biceps tendinitis). No specific treatment is usually required. Sternoclavicular joint Dislocation of the sternoclavicular joint is comparatively uncommon; there is always a history of trauma, and the joint asymmetry is obvious if looked for. In some cases, especially where the medial end of the clavicle comes to lie behind the sternum, there may be an associated thoracic outlet syndrome. Good radiographs are often hard to obtain and their interpretation is difficult. The diagnosis should be made primarily on clinical grounds. Symptoms of pain on movement normally settle spontaneously, and only rarely is surgical repair required. 4.1. Inspection (1): the front: Note whether any of the following are present: (A) Prominent sternoclavicular joint (subluxation). (B) Deformity of clavicle (old fracture). (C) Prominent acromioclavicular joint (subluxation or osteoarthritis). 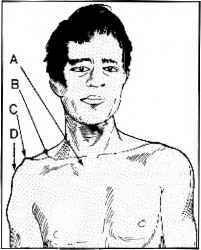 (D) Deltoid wasting (disuse or axillary nerve palsy). 4.2. Inspection (2): the side: Note if there is any swelling of the joint, suggesting infection or inflammatory reaction from, for example, calcifying supraspinatus tendinitis, pyogenic infection of the glenohumeral joint, or trauma. 4.3. Inspection (3): from behind: Are the scapulae normally shaped and situated, or small and high, as in Sprengel's shoulder and the Klippel-Feil syndrome? Is there webbing of the skin at the root of the neck, also typical of the latter':' Is there winging of the scapula owing to paralysis of serratus anterior? 4.4. Inspection (4): from above: Again look for swelling of the shoulder, deformity of the clavicle, asymmetry of the supraclavicular fossae. 4.5. Palpation (1): Palpate the anterior and lateral aspects of the glenohumeral joint. Diffuse tenderness is suggestive of infection or calcifying supraspinatus tendinitis. Very marked tenderness is particularly associated with calcifying suprapinatus tendinitis and gonococcal infections. 4.6. 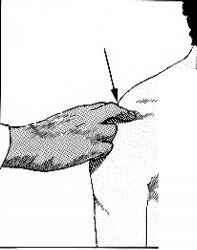 Palpation (2): Continue the examination by palpating the upper humeral shaft and head via the axilla. Exostoses of the proximal humeral shaft are often readily palpable by this route. 4.7. Palpation (3): Tenderness over the acromioclavicular joint is found after recent dislocations, and in osteoarthritis of the joint. 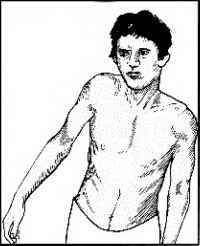 In the latter lipping is usually palpable, and crepitus may be detectable when the arm is abducted. 4.9. 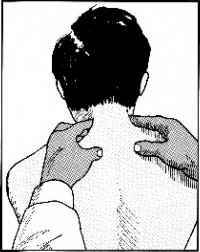 Palpation (5): Palpate the length of the clavicle. Tenderness is found in sternoclavicular dislocations and infections (particularly tuberculosis), tumours (rare), and radionecrosis (usually after treatment for breast cancer). Radiological examination of the claviclc is essential if local tenderness is found. 4.8. Palpation (4): Press below the acromion and abduct the arm. Sudden tenderness occurring during a portion of the arc of movement is found in tears and inflammatory lesions involving the shoulder cuff and/or the subdeltoid bursa. 4.10. 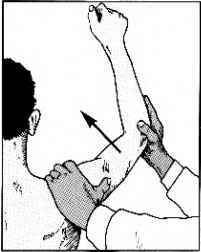 Movements: abduction (1): Ask the patient to abduct both arms; observe the smoothness of the movement and the range achieved. A full, free and painless range is rare in the presence of any significant pathology in the shoulder region. 4.11. Movements: abduction (2): Note whether the patient has any problem with initiating abduction. Difficulty in doing so is suggestive of a major shoulder cuff tear. A history of violent injury may be obtained in the young adult. In the middle-aged or elderly patient a tear may follow comparatively minor trauma, or occur spontaneously in a shoulder cuff weakened by attrition from chronic impingement. 4.12. Movements: abduction (3): Note pain during abduction (which may have to be assisted): (A) During the arc 70-120°, suggestive of shoulder cuff impingement in the region of the acromion; (B) During the latter phase of abduction, suggestive of shoulder cuff impingement in the region of the acromioclavicular joint or coracoacromial ligament, or from osteoarthritis of the acromioclavicular joint. 4.14. 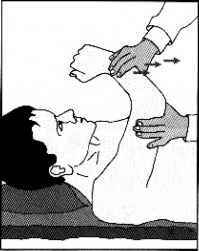 Movements: abduction (5): Ask the patient to hold the arm in the vertical position himself. If he can do so. deltoid and the axillary nerve are likely to be intact. 4.15. 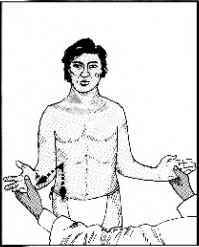 Movements: abduction (6): If the patient has passed the last test, ask him to lower the arm to the side. Again note the presence of any painful arc of movement. Sudden dropping of the arm in the process is a common finding in major shoulder cuff tears (drop arm test). 4.13. 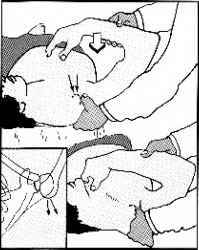 Movements: abduction (4): If the patient cannot abduct the arm actively, attempt to do this passively, remembering to rotate the arm externally while doing so. A full range indicates an intact glenohumeral joint. Measure the range of abduction. In the normal shoulder the arm can touch the ear with only slight tilting of the head. The shoulders have already been compared (see Frame 4.10). Normal range: 0-170°. 4.17. 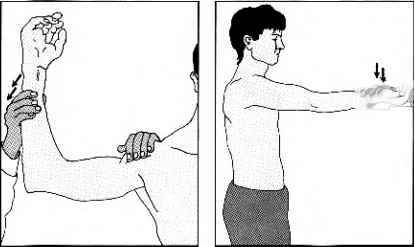 Movements: abduction (8): If both active and passive movements are restricted, fix the angle of the scapula with one hand and try to abduct the arm with the other. Absence of movement indicates a fixed glenohumeral joint, the previously noted movements having been entirely scapular. 4.18. 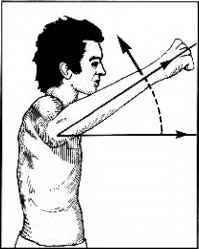 Movements: adduction in extension: Place one hand on the shoulder and swing the arm. flexed at the elbow, across the chest. 4.19. 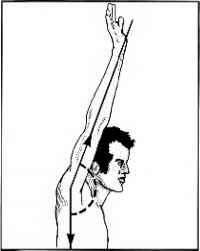 Movements: forward flexion: Ask the putient to swing the arm forwards and lift it above his head. View the patient from the side. 4.20. Movements: backwards extension: Ask the patient to swing the arm directly backwards, again viewing and measuring from the side. Normal range: 0-60°. 4.21. Movements: horizontal flexion and adduction: Occasionally measurement of this angle may be helpful, but it need not be routine. View the patient from above. The arm is moved forwards from a position of 90° abduction. Normal range: 0-140°. Note that pain during this manoeuvre is common in osteoarthritis or trauma to the acromioclavicular joint. 4.22. 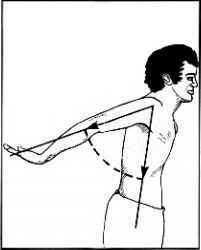 Movements: rotation screening tests (1): Ask the patient to place the hand behind the opposite shoulder blade. This is a useful test of internal rotation in extension. (2): With slight restriction he will not be able to get the hand far up the back, and with severe restriction he will not be able to get it behind the back at all. 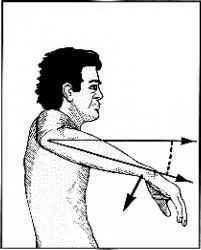 This movement is commonly affected in frozen shoulder. 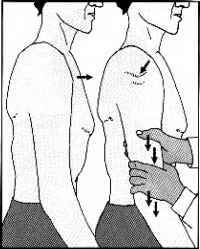 To test subscapulars (which may be torn by violent external rotation, hyperextension, or anterior dislocation of the shoulder), ask the patient if he can draw the hand away from contact with the back when in the position shown. (3): Ask the patient to place both hands behind the head to screen external rotation at 90° abduction. Compare the two sides. Lack of success or restriction is common in frozen shoulder. 4.26. 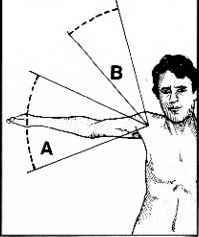 Movements: internal rotation in abduction: Abduct the shoulder to 90°, and flex the elbow to a right-angle. Ask the patient to lower the forearm from the horizontal plane. Normal range: 70°. 4.27. 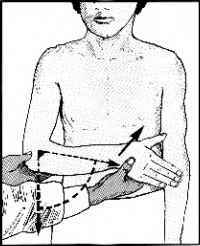 Movements: external rotation in abduction: From the same starting position with the forearm parallel to the ground, ask the patient to raise the hand, keeping the shoulder in 90° abduction. Normal range: 100°. 4.28. Movements: external rotation in extension: Place the elbows into the sides and flex them to 90° with the hands facing forwards. Move the hands laterally, comparing one side with the other. Normal range: 70°. Note that an increase in external rotation in extension is a feature of tears of the subscapularis muscle (see also Frame 23). 4.29. Movements: internal rotation in extension: Move the hand to the chest from the facing forward position. Normal range: 70°. For most clinical work, assessment of abduction and screening rotation in the shoulder should suffice (but record angular ranges of movements in all planes for monitoring progress and for medicolegal reports). 4.30. Shoulder elevation and depression: This may be assessed by direct measurement (see 4C), but Halla^eli and Giinal advocate the use of a goniometer, centred on the jugular notch, with one arm vertical and the other on the acromion. Normal range: elevation and depression in the order of 37° and 8°. Elevation (shrugging) gives a measure of trapezius function, and may also be used to assess hand recovery after stroke. These movements are also impaired in any condition involving scapulothoracic movement. 4.31. Cervical spine: Always screen the cervical spine in examining a case of shoulder pain; this is doubly important if shoulder movements are found to be normal. 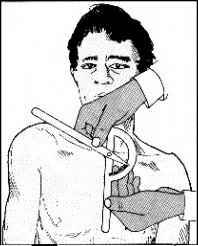 (1): The apprehension test: Stand behind the patient (preferably seated) and abduct the shoulder to 90°. Slowly externally rotate the shoulder with one hand while pushing the head of the humerus forwards with the thumb of your other hand. Apprehension, fear or refusal to continue is evidence of chronic anterior instability of the shoulder. Repeat at 45° and 135° abduction. Pain only may be felt in minor subluxations. 4.35. Anterior glenohumeral instability (2): Relocation test: Repeat the apprehension test with the patient in the recumbent position; abduct and externally rotate the shoulder (1). 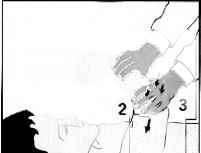 When pain or apprehension first appear, press down on the upper arm (2). This will stabilize the head of the humerus in the glenoid at the time when subluxation is imminent, and should relieve any pain or apprehension. This, and the return of pain and apprehension on release of the downward pressure, is confirmatory of anterior instability. Pathology in the rotator cuff may be suspected by the performance of abduction and the drop arm test (see 11 and 15). Neer impingement sign: pain occurs when the shoulder is flexed to 90° and forcibly internally rotated. 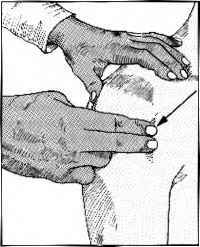 Aleer impingement test: the test is repeated after injection of 10-15 ml of 1% xylocaine into the subacromial space, when less pain should be encountered if the pain is due to impingement of the rotator cuff against the acromion. 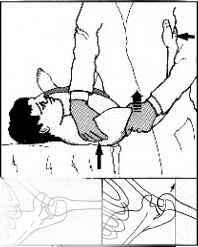 (3): Drawer test of Gerher and Ganz: Support the (supine) patient's relaxed arm against your side, with his shoulder in 90° abduction, slight flexion and external rotation. Steadying the scapula with the thumb on the coracoid and the fingers behind, try to move the humeral head anteriorly with your other hand. Observe any movement, clicks and patient apprehension, and compare the sides: axial radiographs may be taken in confirmation during the procedure, which is sometimes performed under anaesthesia. 4.37. Posterior glenohumeral instability (1): Drawer test: Where recurrent posterior dislocation is suspected, hold the relaxed, supine patient's forearm with the elbow flexed and the shoulder in 20° flexion and 90° abduction. Place the thumb just lateral to the coracoid. Now internally rotate the shoulder and flex it to about 80°. pressing the humeral head backwards with the thumb; any backward displacement of the humeral head should be detected with the thumb, but X-ray confirmation may also be made. 4.38. Posterior glenohumeral instability (2): The jerk test: With the patient's shoulder over the edge of the examination couch (1). flex both the shoulder and elbow to 90° (2). With one hand on the elbow, push downwards (3) and attempt to sublux the humeral head posteriorly. If this occurs, indicating instability, a jerk or jump will be felt. If negative, repeat with the shoulder adducted and internally rotated. 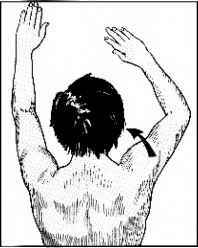 The sulcus sign: With the patient standing, grasp the arm and pull it downwards. If there is inferior laxity then a depression will become obvious between the humeral head and the acromion. This is of greatest significance if absent or less on the good side, or if accompanied by pain and apprehension on the affected side. A positive test is usually indicative of multidirectional instability. 4.40. 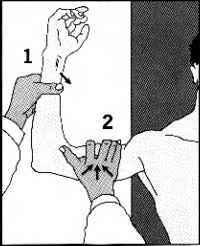 Biceps tendon instability test: The shoulder is abducted to 90° and the elbow flexed to a right-angle. The tendon is then located as it lies in the bicipital groove and, keeping the examining fingers in position, the patient's shoulder is internally rotated. If the tendon is unstable it may be felt to move out of position; this may be accompanied by an audible click. 4.41. 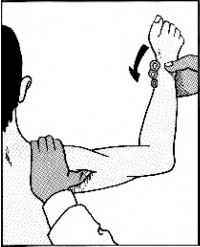 Biceps tendinitis: The Speed test: With the elbow fully extended and supinated, the shoulder is flexed to 90°. The patient is asked to resist as the examiner tries to extend the shoulder. There is complaint of pain during this manoeuvre if there is inflammation in the tendon. Does scapular winging occur in rhuematoid arthiritis? Can you palpate the supraspinatus? Why shoulder abduction remitted in arthritis? Can rhumatoid arthritis cause A winged scapula?